Forgive my absence from the blog for the past few days. The last weekend was a busy one for my family. There was a lot of getting ready. Dominic, my youngest son, made his First Communion Sunday morning. First Communions at my parish, like at every parish, are a big deal. We have them at the regular Masses, though over the course of two weekends. It takes a lot for 250 second graders and families to squeeze all the special ceremony into the Mass with less than two hours between Masses at a parish of 4000 families. Nevertheless, we do it every year and it works out fine. Actually, it's a great witness to many family members, some of whom are not Catholic, who may be visiting our parish for the first time. Regular readers know that my youngest son has autism. It was a job to get him ready and I could never say thank you enough to his three religious education teachers. Still I was nervous about everything happening right, so half way though the liturgy when Dominic decided to tell me that he was "allergic" to the host I knew that I'd better pray hard. Here was the deacon and family next to the front row doing some major whispering to Dominic about his "not" having bread allergies. "It's the Body of Jesus," I told him "no one is allergic to Jesus." Finally, in a humorous sort of way, I told him that if didn't eat it he would die and then I turned it over to God. Really, I did some of my most desperate praying at that moment while my boy sat there saying "hosts taste yucky." Father had joked with me before Mass that root beer intinction was not an option. Then the time came for communion. We stepped out into the aisle. Dominic first--I wanted to whisper to Father, "break a small piece for him," but I didn't. Dominic got one of the triangles off the big host, which evidently sparked an interest. Now comes the funny part--there was not a thing I could do about either--Dominic broke his host and handed a piece to mom, "here you go mom, he said," and then he broke a piece for me and all three of us had our small bland-tasting piece of the precious Body of Christ. I was never so relieved in all my life to see him eat it. Never mind the chalice. I figured I wasn't that lucky. We just herded him right past it. When we got back to our pew the first thing Dominic said was, "At what time will I receive communion next week?" I was reflecting on my way home from work this afternoon about God being present with us Sunday. There was never a chance that Dominic wouldn't receive his First Communion. However, only a day later could I clearly hear God at Mass saying, "Settle down dad. I'm in charge here!" :'-) The Lord works in mysterious ways. God bless you all so much. I know this was traumatic, but I can't help giggling, and wondering how Dominic's first Confession went! He's a cutie! This is a beautiful post DD. God bless Dominic..and his family! We have two autistic children. I remember our trepidation at their first communions but they both did fine. Our daughter is now 18 years old and practically floats down the aisle after reaceiving these days. She is so in tune with the Sacrament that it is almost erie. She asks to go to confession if she feels she isn't worthy to receive communion, and then will happily float up to receive at the next mass. Our 22 year old has never had a moment of doubt about the real presence. His faith is a matter of fact. Catholicism makes sense to him, period. Thanks for your responses and your prayers! 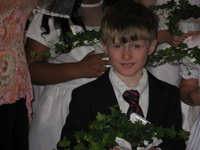 Dominic did great this week for his "second communion." I'll be adding new posts this week--beginning tomorrow evening. Check back with me later. Maggie, floating = grace-filled to me. Your children sound positively grace-filled. How wonderful. For Dominic first Confession was just like talking to Santa in reverse. Instead of lying and saying how good he had been he told the truth and said how naughty he had been. First, Westley, are you Catholic? Have you been baptized? Don't worry about being punished for having taken communion without first going through the necessary classes and stuff. Talk with a priest at your church to find out what you need to do. I'd say just start learning about it, but your parish may have a program for you. Yes, first communion is a big dress-up event--the girls dress in white and the boys wear suits and ties, but it doesn't have to be. Wearing something else won't invalidate it for you. Your mom didn't literally mean that you have to read the whole holy bible first, but just that there's lots to be learned first. Yes I am catholic and I have been baptized when I was born. The thing is I just started going back to church about 2 months ago. I think I should take it little by little. Thanks, i'm not punished. Sigh but it made me worry.By the I started to read the bible recently.Thanks! Great, Westley, stay in touch. I'll be posting more regularly--probably daily--as soon as the school year ends.